iWoofer, iWoofer, will rock you…. This is the latest iPod speaker system introduced by Rain Design. iWoofer allows you to enjoy your favorite number with some added bass to it. 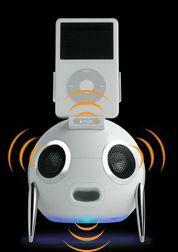 iWoofer includes subwoofer and it’s the smallest iPod speaker. Either its iPod video or shuffle every model fits into it. It adds FM radio to your mini iPod with features like auto scanning and channel memory. Apart from playing music by means of its 2.1 stereo system it can also charge your iPod. It is priced at $129.